In a previous post, I mentioned how I had to create a patch, or inlay, to cover over a knot. Now the first question you may be asking yourself is why I didn’t use another board for this particular piece. In this case, the selection of lumber was pretty slim and I just decided I had to make do with what I had. I really did think that this defect was far enough away from the edge to be hidden by the cove trim that was to be applied to that face. But I was wrong. By the time I routed the profile along the edge, the knot would be visible on the finished project. I had to resort to some training I received from Tim Rundall, owner of The Woodchip Shop. 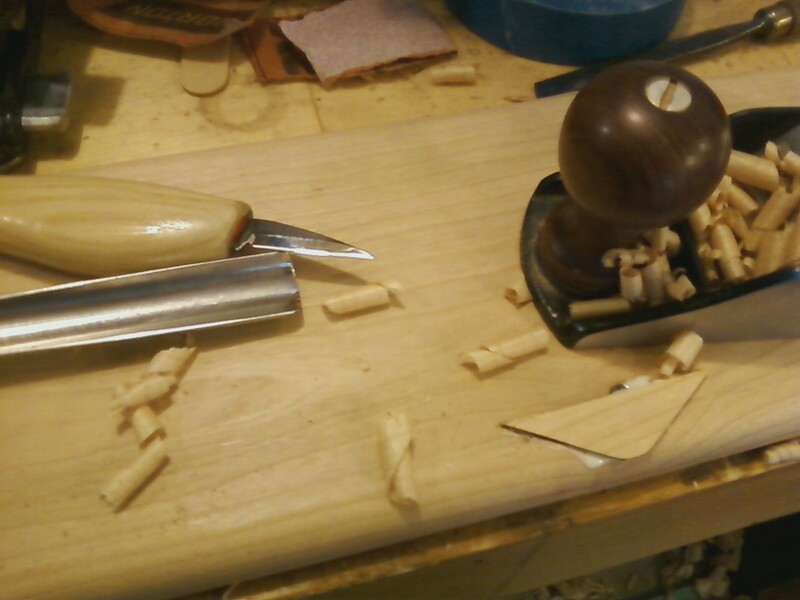 Tim taught me how to carve and the proper use of the tools, so I dug out my carving tools. The first order of business was to make an inlay. 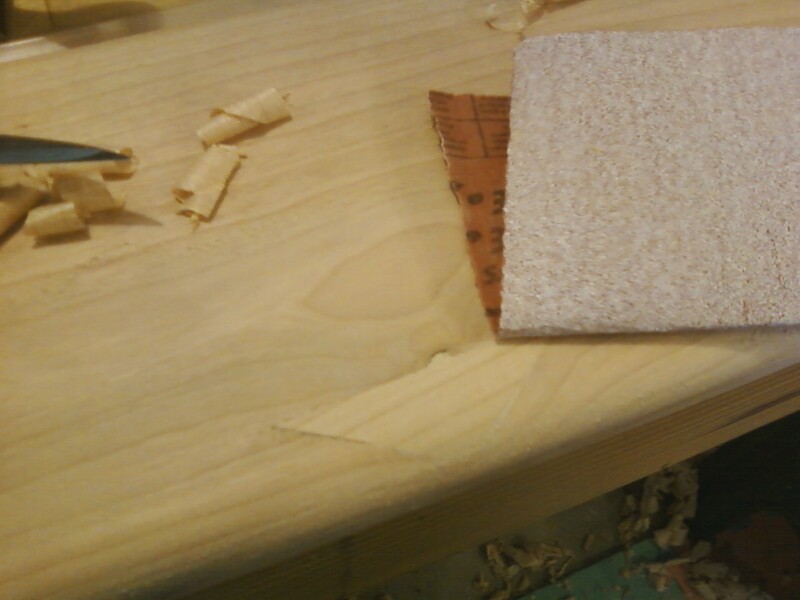 I happened to have a scrap piece I had cut from the same board. I used a gouge and straight chisels to form the shape of the inlay. I used a saw and the disk sander to finalize the shape of the inlay. The next step was to use the inlay as a pattern to lay out the recess for the inlay. I used a sharp knife to trace around the inlay. Then I took the same gouge to form the rounded part of the recess. Using a detail knife and some other carving tools to deepen the recess, I kept working at it until the inlay was a tight fit. 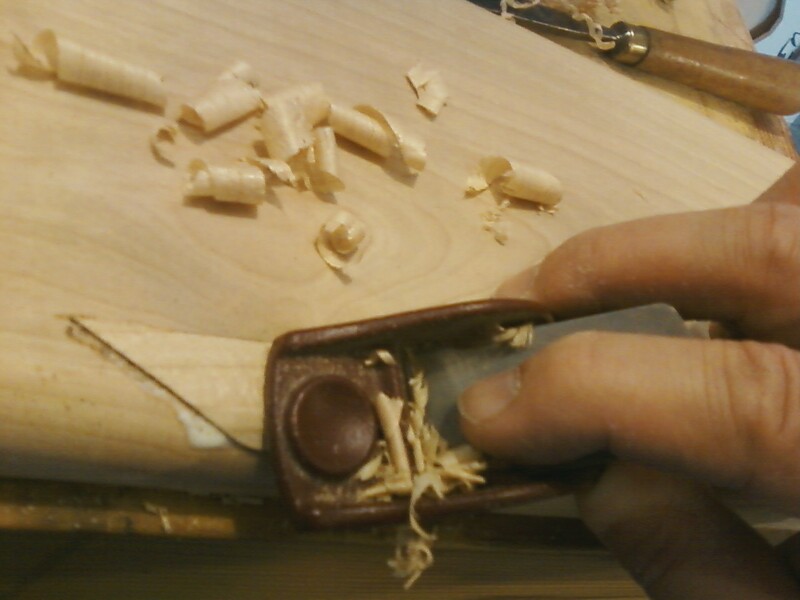 After gluing the inlay in place, I started working it flush to the workpiece with hand planes. While the glue was still wet, I sanded it to its final shape, smooth with the surrounding profile. After the project was finished, you’d be hard pressed to find the patch. The color and grain match did a great job of disguising the patch. In a previous post, I mentioned the bed rails I was making for a couple to replace their broken ones. I created a slot for the bed rail hooks by laminating 1/8″ Baltic birch plywood between two layers of poplar hardwood. This worked great except that the slot was visible on the top edge of the rails. I cut some thin splines from a scrap piece of poplar to fill the gap. 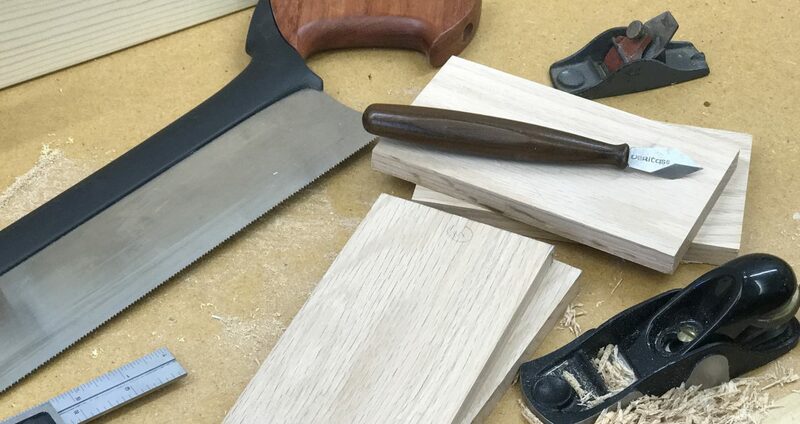 I glued them in place then trimmed them with a small gent’s saw, like the one you see here. by reinforcing it with a brass back.